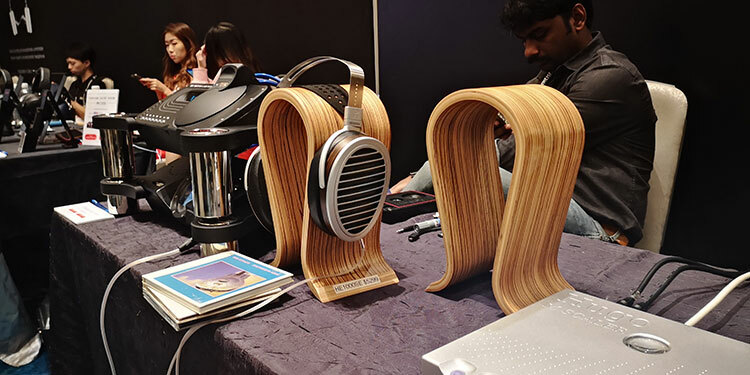 This is the second of a two-part feature on the recent CanJam Singapore 2019 show which ran from March 30th to 31st in the Pan Pacific Hotel. You can read up on the first part here which covers purely portable sources and monitors. 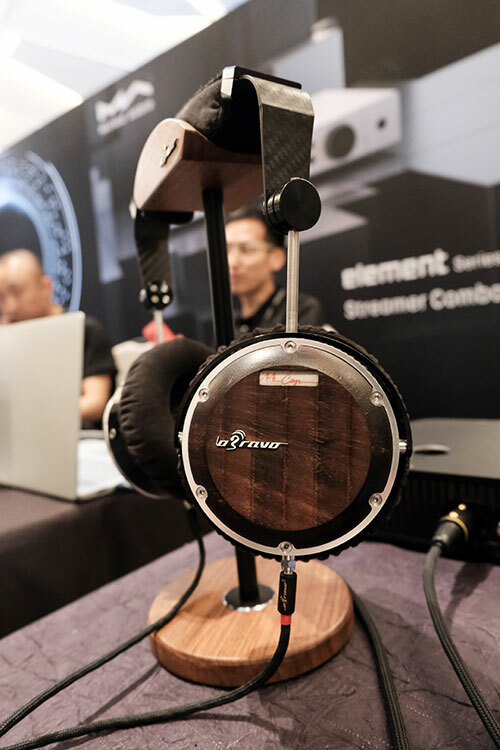 So with part one out of the way we now revert to headphones, amps and DACs and CanJam Singapore 2019 was probably the best of the three shows I have attended for desktop audio product quality. There were some new launches and some gear that has been out for a while but I had yet to hear it. Fantastic products such as Chord’s M-Scaler, Alex Rosson’s new RAD-O and the highly desirable RAAL-Requisite SR1A all will be covered. 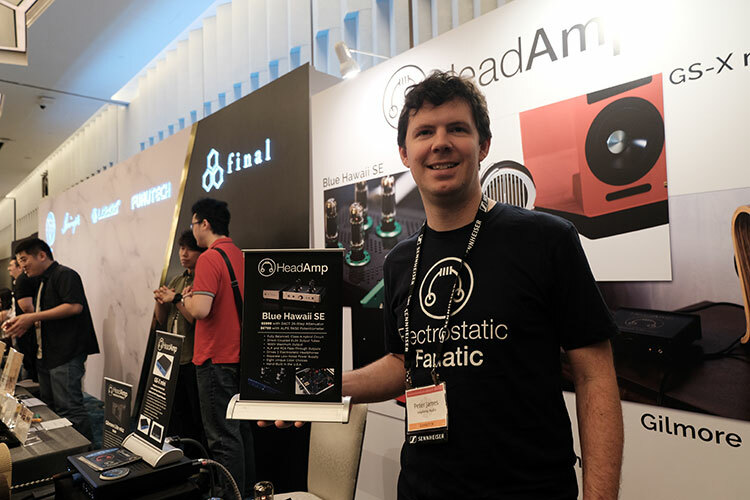 It was great to see Peter James manning a HeadAmp booth finally at CanJam Singapore 2019. Dan and MrSpeakers have been pushing their fantastic Blue Hawaii SE hard in their absence so it was great to see the makers of such a great tube amp finally here in the flesh. And oh boy his stand was adorned with a stunning green version of the Blue Hawaii SE. Personally, I am OCD and I think I would have to have this in blue to match its name. However, I have to admit my recent lurch to bolder color schemes in our home leaves me loving the zanier green version. (Note the separate power supply is just out of sight in the shot). This amp is something special with electrostatic headphones (you cannot plug regular cans into it). I have some decent electrostatic amps at home that I am very fond of but the Blue Hawaii SE trounces them with the likes of VOCE from MrSpeakers and the 007 MK2. This is an extremely natural and realistic sounding amp. I believe it is a hybrid amp also with a solid-state initial gain stage and a tube output stage. Some of that influences the sound so it is not soft or as ‘romantic’ sounding like a full SET can get, retaining a little of that punchier faster solid-state sound. It is a great pairing with the VOCE that was on the stand beside it. 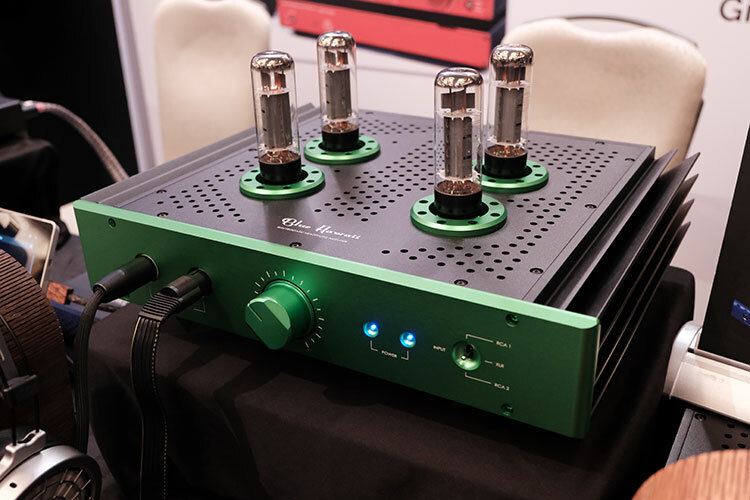 the VOCE is quite a natural sound and it needs a lot more power than the Stax alternatives. I had no issues driving it from the BHSE. This is the one. The ‘headphone’ that created the biggest impression on not just me but plenty of others who tried it. The SR1a is not so much a headphone. Those who have used the old AKG K1000 will be familiar with how the SR1a sits outside your ear to create an almost speaker-like experience. In fact, RAAL-Requisite actually refers to it as an Earfield™ Monitor. 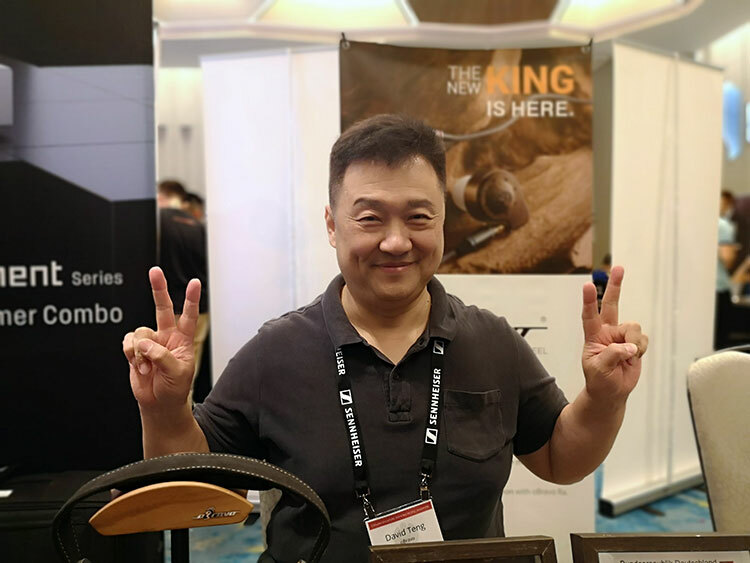 The design is also being touted as the first True-Ribbon™ headphone that allows RAAL to do away with sealed chambered bass designs and keep the design entirely open for the widest possible frequency response. You can see from the pictures it does have a slightly boxy Stax look to it but perhaps just a little rawer in its design. I like the design personally; I love exotic nerd aesthetics and it is definitely unique. It is not that heavy at 425g but does require a slightly studied approach to putting it on your head so you get the right ear to ‘speaker’ alignment. 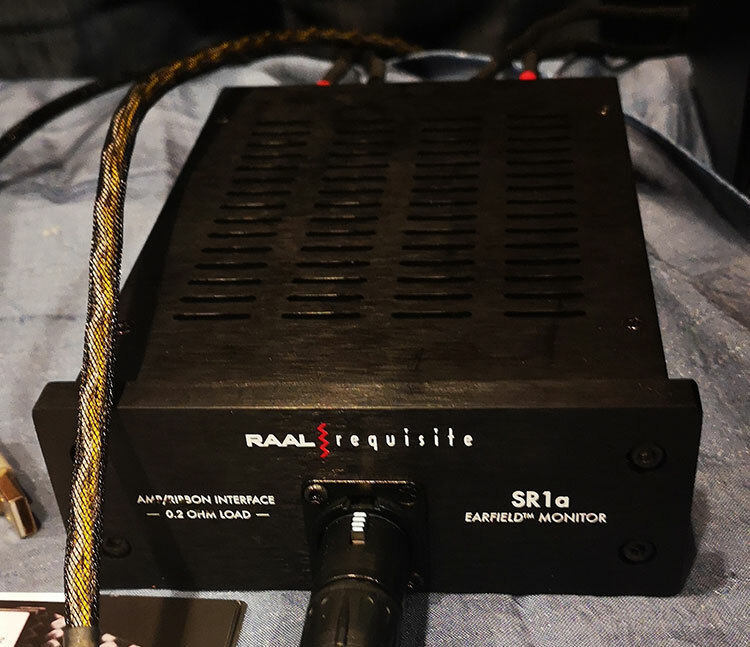 The SR1A also comes with a little impedance matching box which acts as a buffer between the headphones and whatever amp/source you connect it to. Note the box uses speaker binding posts so this is going to work primarily with a power amp/Preamp and DAC rather than a pure headphone amp unless said amp has binding posts on its rear panel. 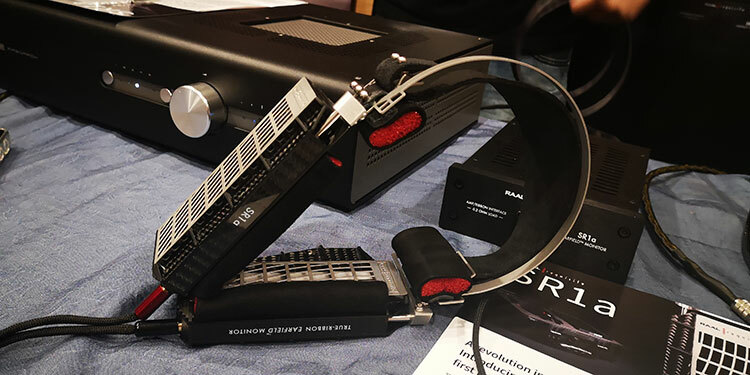 Plugging directly into a conventional headphone amp will short the SR1A. Well, damn. Probably the best recreation of a natural speaker sound in a headphone I have heard to date and that includes the AKG K1000. I spent about 30 minutes in total listening to the SR1a alongside Tony Pothitos of HiEnd News and we both came to the exact same conclusions. the SR1A has a beautiful level of crossfeed that creates a stunning speaker-like presentation with nothing in the way of traditional left-right separation found in traditional headphones. It just sits “out there” like a great set of speakers. More than that the timbre is to die for. You will hear zero harshnesses, zero exaggerated bass, wonderfully clear and natural sounding vocals and more than impressive instrumental separation and imaging. I could have sat all day and used the SR1A without a hint of fatigue throughout. 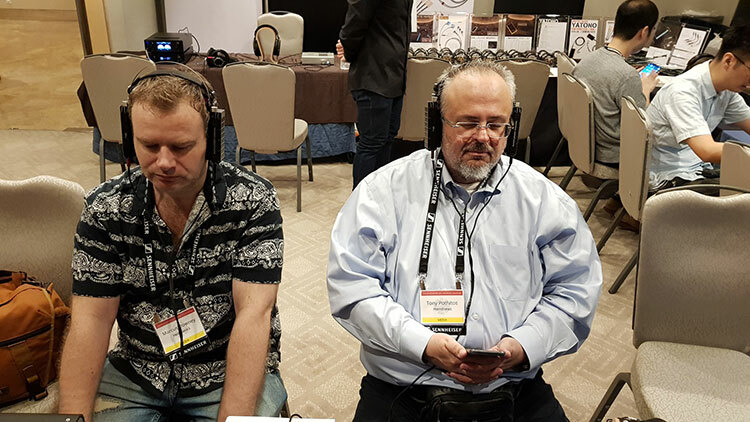 Thanks to Sean Thong and SLT Technologies for bringing this amazing headphone to the show. 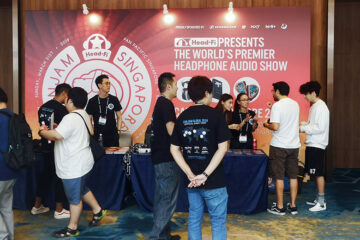 Chord’s booth was excellent this year with the arrival of the Hugo TT2 and the M-Scaler. It also saw Edd Harris’s debut which was nice to finally meet the man who works with us closely on our reviews. Also, the usual show regulars from Chord were also there – Rob Watts, Robert Wong and John Franks with Rob doing some great presentations upstairs. There was a moment during my testing time when the Chord team was introduced to Krispy Creme donuts which seems to be rather a momentous event for the uninitiated. Not exactly healthy but delightfully sinful I suspect with a cup of strong coffee. Just not too many eh lads? 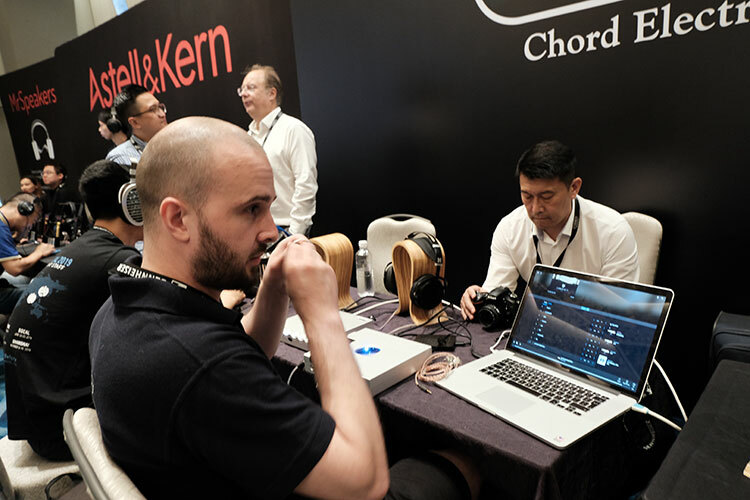 Our testing at the Chord booth focused mainly on the M-Scaler and the new TT2 and I have to say with a quality set of headphones this combo is thoroughly addicted and beautifully clean sounding. Now I say with the right set of headphones because my first demo was with the HE5SE from Hifiman. I love this headphone but it is still not the right headphone for me in terms of pinpoint imaging and micro-detail. 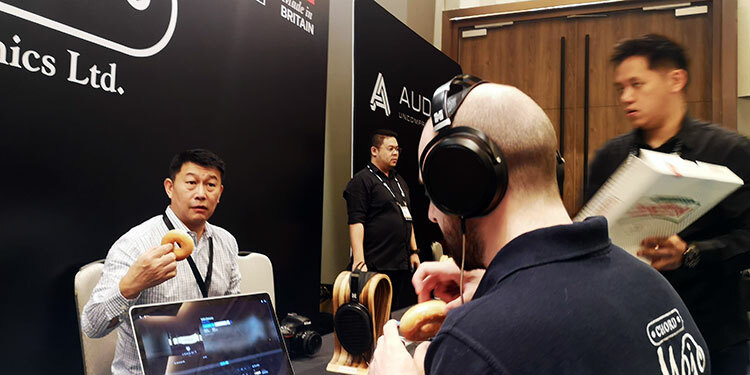 It is a slightly older double-magnet planar driver from many years ago and their new nano-grade driver headphones such as the Susvara and even the cheaper Ananda do a far better job when it comes to soundstaging. 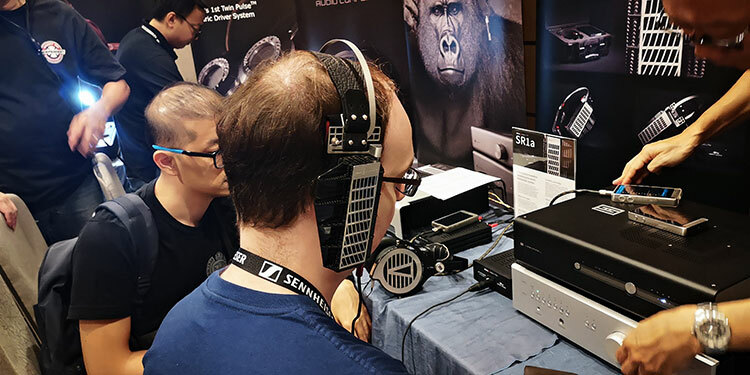 Change those headphones to say the HE1000 SE which was beside the mighty DAVE and you get a far more revealing example of what the M-Scaler can do combined with a quality amp such as the TT2. 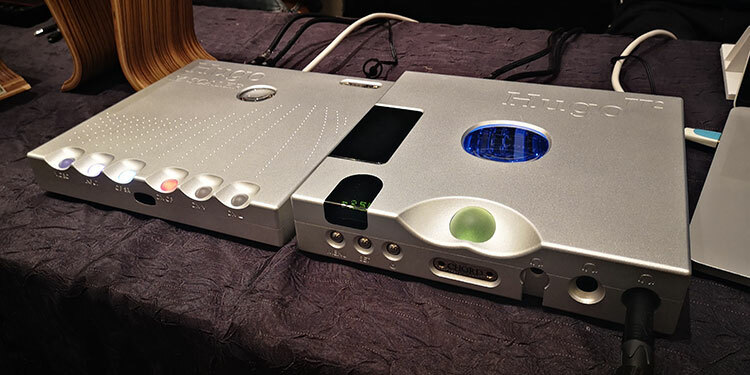 For those that are not aware, the Hugo M-Scaler is a standalone upscaling device using Rob Watts’ unique filter technology to upscale standard 44.1kHz digital audio up to 705.6kHz. I actually have the NuPrime CDP-09 which has similar upscaling from a delta-sigma design but the difference between these two is a bit more revealing of what is possible. It is designed with the TT2 in mind but will work with our DACs not in the Chord eco-system so it is flexible beyond their own product range. I was sort of half-expecting some improvements in the presentation using the M-Scaler but its way beyond that. The dynamic range is just excellent whilst still retaining a wonderfully smooth sound. There are no funny volume quirks that can sometimes happen with lesser upsamplers and not once did I ever feel the output got overly digital sounding which is another complaint I have once you pop past 96k. I am pleased to say though we will be studying the M-Scaler in a lot more detail later in the year with a full review and a wider range of headphones. A very impressive initial set of impressions though. David Teng brought along a wide selection of his oBravo gear, many of which we have covered here. This is the team responsible for the outstanding but very expensive Ra C-Cu as well as my personal favorite, the EAMT-2C. 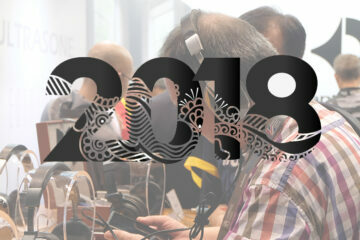 Now, this year oBravo have been working on a lot of new projects including some new and very interesting looking IEMs. However, at the show (and now at our office) he brought along a new MKII headphone which David is pitching for well under $1000. This is a hybrid dynamic driver and AMT tweeter semi-open circumaural headphone. This is quite the contrast from his Signature flagship headphone at $6000 and to tell you the truth the visuals between the two are quite similar. 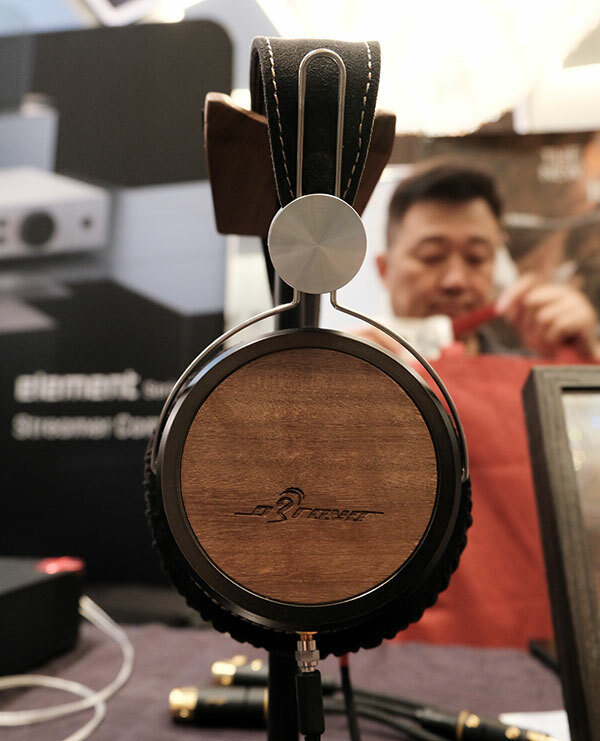 I asked how he managed to get the new HAMT MKII down to under $1k and he pointed out a few areas such as a small capacitor, use of plastics and a wood veneer finish rather than the much higher-end wood and a solid aluminum blend of the bigger Signature Series. It also has the old Hifiman system of coaxial connectors but the quality of these connectors are much superior and I had no issue attach or detaching the cables which is a welcome relief. In all, it is a handsome headphone, with a moderate sideways pressure bias and medium clamp offset somewhat by the soft Alcantara circumaural pads. The sound also has two presentations, meaning you can adjust it on the inside with a series of holes that you either cover or leave open with some plugs. Now our test unit does not have the plugs to cover the holes so I am told ‘open’ is the bassier option and closed with the plugs is the more balanced sounding of the two tunings. And it indeed it kicks like a bloody mule with a decidedly v-shaped musical tuning that will greatly favor modern rock and pop, dance, R’n’B. Vocals are fairly behind the forward low-end, more so female than male suggesting we have a 2-4k dip in there competing with the enhanced bass. Treble is as you might suspect using AMT, it is clean, articulate and slightly forward. You get a little of that seeping into the harmonic balance for percussion but nothing that would cause annoying sibilance so vocals sound fairly accurate in tone. I will be interested to hear the balanced version once the plugs arrive and we can put it through a full review. For now, the bass option delivers potent synth wave and EDM beats and nicely contrasting treble but slightly less focused for vocalists and classic midrange rock. smsl p1/d2 combo. Is it on par with the hugo tt2 mscaler combo? I did not have enough time at the show to come close to making any conclusions on which is better. Different headphones, noisy environment etc. I would need them both here for a few weeks to make any definitive comment.